Actor Ram Pothineni »”>Ram Pothineni was born on 15th May 1988 in Hyderabad city, Telangana state. Though born in Hyderabad he was brought up in Chennai city. He attended Chettinad Vidyashram and St.Johns School, Chennai. He made his acting debut as a child artist with Tamil short film ‘ID’ when he was just 12 years old. Ram Pothineni made his debut in lead role with Devadasu in 2006 co-starring Ileana D’Cruz and Sayaji Shinde, the movie was a biggest hit of the years completing 175 days in several centers. His second film Jagadam failed at box office. He subsequently delivered numerous commercial hits like Ready co-starring Genelia D’Souza, Nassar and Brahmanandam, Maska co-starring Hansika Motwani and Brahmanandam, Rama Rama Krishna Krishna co-starring Arjun Sarja and Priya Anand, Kandireega co-starring Hansika Motwani and Sonu Sood, Endhukante Premanta co-starring Tamannaah and Richard Rishi, Ongole Githa co-starring Kriti Kharbanda, Prakash Raj and Ajay, Masala co-starring Daggubati Venkatesh and Anjali, etc. He was born to Murali Mohan Pothineni and P. Padmasree. He has a brother named Krishna Chaitanya Pothineni. He has a sister named Madhu Smitha Pothineni. 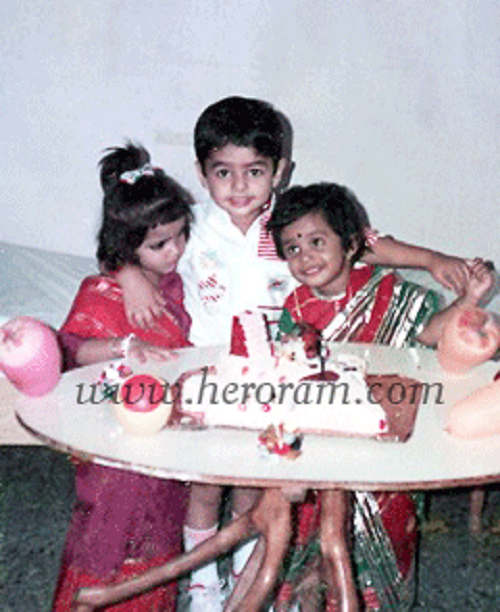 He has an uncle named Sravanthi Ravi Kishore, popular movie producer.